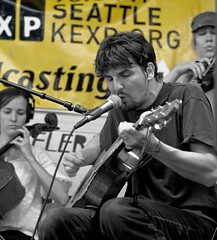 Cloud Cult is one of my favorite bands and also one of my favorite live performances. I got to see them play a few songs up close at Sonic Boom yesterday afternoon in Ballard before seeing them again that night at Neumos. I saw and heard them for the first time at the KEXP BBQ last summer and fell in love with their music. They just put out a new album and it's as good if not better than the first. During each show they have a person on either side of the stage painting to the music. Each painting they do is different. I'd love to buy one, but I don't think I would pay as much for them as they probably go for. They auction them off in a silent auction at the end of each show. They are fun to watch an listen to.